Pruitt launches science bomb: insists EPA only use data that is public. No more secret science. In a bombshell, Scott Pruitt is expecting scientists to act scientifically. In the US the EPA has been making rules that cost billions based on studies from groups that refused to publish their data. Regulations like The Clean Power Plan were estimated to cost $8.4 billion and magically return $14 – $34 billion in “health and climate benefits”. Scott Pruitt plans to pop that bubble. My only minor, tiny, complaint is that there is no such thing as “secret science”. If it can’t be replicated, it isn’t science. What Pruitt is stopping is Fake Science. The Union of Concerned Scientists immediately leapt to defend the right of certified scientists to issue declarations that no one could test or assess. Evidently, the Union of Concerned Scientists aren’t too concerned about whether “scientists” are acting scientifically. Like all unions, what matters is pay, power and working conditions, never mind about the Scientific Method. In the Australian version, the BoM swamps skeptics with data, but admits it keeps its methodology secret. Only fully trained members of the sacred guild can play data games and issue prophesies. Tellingly, environmentalists and democrats oppose the idea of transparent data. UPDATE: As Joe Bast says — Congratulations to Steve Milloy, Jim Enstrom, Stan Young, Robert Phalen, Willie Soon, and Lamar Smith for leading a years’ long effort to restore sound science to EPA. h/t Robert, Scott of the Pacific, Pat, Jim S.
123 comments to Pruitt launches science bomb: insists EPA only use data that is public. No more secret science. Might only cost 8.4 bill. Depends. That .4 at least sounds specific. Might return 14 bill in benefits, or might return 34 bill. Depends. Could be right. Depends. At least there are no round numbers. Anyway, a benefit can be one thing, can be another. Depends. Do data and methodology need to be made public? Depends. All that data and method stuff can kill a really good conclusion. Depends. So does everything just depend now? Depends. In fact there is one absolute in po-mo science: you should publish. That does not depend. And people fall for it! Trouble is, costs are in hard cash, the benefits are in a special, notional currency which isn’t accessible to the taxpayer. That .4 could set a lot of competent lifters on their way to successful profitable careers. Anyone who wants to keep their data proprietary should not be supplying studies, data and results to any governmental agency. The government should not be relying on proprietary data and results, especially not for policy setting. If it can’t be independently verified, if we have to “just believe” the “reports” – then we are getting uncomfortably close to the old (probably current as well) Soviet way of doing things – here’s a report, it’s true until we decide otherwise. Quite a few concerns became used to denying access to their methods and data under past presidents. Especially the last president, who touted how transparent his administration was going to be – claimed it was the most transparent, I recall. It wasn’t. It is so simple & so elegant. The scammers now have to expose themselves as scammers, or get off the gravy train, & out of the climate business. Rather than running around trying to get the worst of them off the public teat, with a great effort, Trump/Pruitt have made them chose to get out themselves, or be exposed for what they are by their own hand. Help folks, how the hell do I get this smile off my face? I see some light at the end of the tunnel. The EPA might have to discard the CO2 endangerment finding. I mean, how do you prove the hockey stick theory? On other fronts, it is encouraging to see some Australians realizing that windmills should be used together with pumped storage. Germany has realized that onshore windmills should be close to places like Austria where pumped storage is practical. caused the world to squander trillions on “renewable” energy. Oh really? Seriously? At what cost? The price of more lives beyond those already crucified by the UN, those hundreds of thousands if not millions that have already been faced with the stark choice of being warm and destitute … and dying, or being cold and damp … and dying, or being marooned in a Third World prison of under-development and disease, … and dying. All at the behest of ideologically motivated UN policy with its constellation of well heeled comfortable cling-ons in New York or Brussels, the rank and fetid halls of corrupted, post-modern climate scientivists, the IPCC, the UNEP divestment scam, UNFCCC, ‘Civil’ Society together, all these together with the array of pecksniffian eco-Marxist (post-modernist) Leftist governments and their MSM propaganda arms, whose sole contribution to human history is the evidence of the growing mounds of the dead, adding to those hundreds of millions of crucified people who have already had their lives stolen from them by the social experiments of the Left. Murderers all. And it has to stop. Now is a time for actions that can only engender freedom, and foster prosperity, actions that furnish all with opportunities that may lead to the further flourishing of wider humanity … and actions applied with urgency, if or as the climate become colder. If law and justice was the way the timmy flim-flam would be in solitary confinement and his assets resumed, plus ABC and BOM abolished for contributing to the delinquency of a [snip]. If they now realise they need to put their (on-shore) wind turbines near Austrian pumped storage, what are they going to do with all those underperforming wind turbines in the North? Switzerland also uses pumped storage, mostly from France. The Germans do the same thing the government of Ontario does. They raise the windmill voltage really high, disable the off-spec automatic trips, and beg their neighbours to take their hydro. Why can’t it be released? If there are no national security concerns, then there is no legitimate reason for not releasing the data to the public. No matter if the tax payer funded it in part of whole if they will not released the data, sources, or methods, then it should not be used because it is not science. All data, sources, and methods must be released and Peer (Pal) review is not the scientific method. Give continuous answers that don’t address the real issue-check. Play the victim card of innocent people trying to do good-check. Portray an element of fear and danger over the oppositions motives-check. Throw in an obligatory communist catch cry (moving forward)-check. Blame secret Russian intervention for this interference…….not yet. And again on Russian interference……….. The Russian poisoning story has hit the rocks – but the MSM in the UK (where I am right now) is still going full speed ahead. The Salisbury hospital consultant who is treating the 3 victims wrote to the London Times 5 days ago to say that there was no nerve gas – and no one from the media has interviewed him. It is all fake. They are simply trying to spoil the Russian elections – which failed – and the football world cup. I know that, you know that but the sheeple all follow the fake news as presented by the MSM. In fact it is just a cover up for Mrs May’s failure as PM to follow the will of the people and get BREXIT over and the UK out of the EU. If it’s secret, peoples’ imaginations can run wild. Think of the progressive agenda possibilities. Plus you never have to defend your methods and conclusions. You can just say it settled and that’s that. The veil of secrecy allowed Karl to throw doubt on the Pause just in time for Paris didn’t it? It would have been rather inconvenient if the sloppy methodology had been exposed for all to see beforehand. and Peer (Pal) review is not the scientific method. I have been told in no uncertain terms by an internet AGW advocate expert that it is, though. That the pal review method is the only method that matters. In fact I have been told that I am ignorant and uneducated by the same expert for saying that is not. Peer review is for JOURNAL publication. this is untrue. It is for grant funding and go ahead for research access and ethics proposals. Peer review -> Journal/conference -> funding. RE: (climatism) pal review. Try placing ‘retraction’ in the search function of this site. There’s plenty there to provide endless vibrant entertainment as you feed your favoured ‘internet AGW advocate expert’. ‘Social psychology’ unfailingly provides an excellent place to begin, particularly when it is from Bristol University. Recursive Fury, the ideated paper that Stephan Lewandowsky, John Cook and Michael Hubble-Marriott tried to publish early last year, was of such poor quality that it was placed in the scientific limbo-land of being not withdrawn, not retracted, and not published for almost 12 months. Lewandowsky previously published an article claiming skeptics believed the Moon Landing was faked, based on only 10 anonymous internet responses gleaned from sites that hate skeptics. Recursive Fury made out that skeptics who objected this previous paper were barking-mad conspiracy theorists with nefarious intent. Finally, a week ago, the journal issued a strange but brief official retraction notice. It highlights a number of identified and recognised problems inherent in the current state of peer review. Can we call them Dark Facts? Good news. This reform is long overdue. Too long EPA has been a private clubhouse where $billions were spent in our name but the basis of decision making was secret and so were the data. That was a crooked, nasty way to run the EPA. Good news, better days ahead. Really? the same people will preside over the undoing of the damage of the last 20 years? Sack the lot of them and start again. Some should be put in front of the Nuremberg type trials for the crimes against humanity. Slowly but surly, the deep state is being pulled out of its 12th Century religious secret order infallibility and into 21st Century open, objective, and rational science. They object because they might actually have to do real work and PROVE their diktats. Personally, I think they ALL should be fired without benefit of pensions and have to get real jobs, do real work, and actually earn their living for a change. That is if they could find an employer willing to hire them. Luckily for them Lionel, there may be spared due to an insufficiency of lamp posts and piano wire. Real work might very well be beyond them. Indentured labour has the right ring to it. No, I think they object because they’re being deprived of the elite sanctified positions their Leftist political dogma promises them. They damn well know they haven’t a snowballs chance in Hell of ‘proving’ anything … most especially their diktats. There is no real climate data used today. and “adjusted” raw data (under 50%). if measured accurately in the first place. you no longer have real data. which are not checked for accuracy every year. (both of which correlate well with each other). What I find remarkable is how certain projections are 70 years out but no one is certain what will happen in the next 70 days. In February, California was looking at the resumption of the drought (only 3% of rain the normal rain for the season) after a very wet rainy season last year. By mid-March, precipitation was 48% of normal and an “atmospheric river” was forecast for the end of this week. http://www.sacbee.com/news/weather/article205831984.html Variability like this would make it prudent to increase water storage for the dry years. Meanwhile, in the same issue of the newspaper, California politicians blocked efforts to increase water storage in the state’s largest dam. http://www.sacbee.com/news/politics-government/capitol-alert/article205939189.html So say what you will about the transparency of the regulatory agencies, some states have problems where they chase away solutions. It all sounds like Victoria, Australia. because you’ll only try to find fault with it … as the Climate fraternity is is so fond of explaining. Scientists are intellectual snobs who critique their work or, even worse, point out errors/omissions/inconsistencies. OK, ‘we’ might not be scientists, but that should be put on one side and the alleged error checked. If the criticism is misplaced then fine, ignore it. To simply dismiss critics because they are not adequately qualified (in their eyes) is disingenuous and another reason for mounting suspicion and distrust. Secret data? For the weather? The only area where data should be secret is defence. The EPA is the Environment Protection Agency, not the Environmentalist Protection Agency. Where is the public interest in keeping data and methods and analysis secret? The whole point of the IPCC was to make global meteorological data public and shared. As for secret homogenizations, secret data, that is once again Druid science, the casting of spells. If public bodies are to direct public policy, it is essential for data and methods to be made public and transparent. There are no grounds for secrecy. This is the weather. The most egregious case is the Michael Mann Hockey stick data which has in US law become the private property of Michael Mann. It would be fair to say this data has cost the world trillions. This private data even at public expense is being tested in law in Canada. The idea of secret private data directing public policy is even more outrageous. It is certainly a perversion of scientific method to accept one person’s truth based on his private and secret data. We will hopefully soon learn if the idea of private data works in Canada. And that, then, goes back to the voter. In the USA, voters in 2016 got it right. And it might be that voters are beginning to get it right in Australia too, if the last couple of state elections are anything to go by. Have you no respect for science of the occult? –Merlin. How dare Scott Pruitt insist & make it compulsory for a Government department, funded by taxpayers to tell the truth. How can one hoodwink & [snip] the public if you have to tell the truth. This practice has to stop, [snip] of the world unite. Maybe we’ll get someone like Scott Pruitt in Australia one day! Scott Pruitt is improving the chance that we might. Issued at 7:13 am Wednesday, 21 March 2018. Weather Situation: Thunderstorms near a trough about the Hunter and Lower Mid North Coast have the potential to produce very heavy rainfall, with rainfall rates exceeding 70mm in one hour. Severe thunderstorms are likely to produce very heavy rainfall that may lead to flash flooding in the warning area over the next several hours. Locations which may be affected include Taree, Harrington, Old Bar, Comboyne, Gloucester, Forster, Seal Rocks, Bulahdelah, Wingham and Dungog. Dungog recorded 117mm in 1 hour from 4:15am to 5:15am from thunderstorms. Rain here in Newy, nice to have some relief after Sunday’s weather ! Hunter Valley has been very dry, this will be a blessing !! Just looking at the weather sat. Andy has a red hand enemy lurking online. Feeling bad about yourself Andy, giving ‘red hand’ a hard time in the past? Andy is a vet when it comes to red thumbs , each one is worn with a badge of honour and pride in knowing he has upset a watermelon and terrorised them with science and logic . I see the red thumb ıdıot has given you a Badge of Honor. Well done! I consider each of them to be worth 10 green thumbs. Yogin Kothari (B.A.) with the Union of Concerned Scientists, quoted as a critic “on the left”, at the same time “works to reduce political interference in federal science and increase transparency and accountability”. The Union of Concerned Scientists: are they “concerned” in the sense of ‘worried, troubled, anxious’ or are they “concerned” in the ‘interested, involved, affected, connected, related, implicated sense’? I think the latter as in government taxpayers grant money. reading the career outline on the link says that Yogin has worked in Washington and later, Central Washington. He is working, without any pay or remuneration to help put into words the outrage felt by all environmentally aware citizens at the dismissal of “The One True Science” by people like President Trump. He is working towards a better world and hopes that his BA majoring in “Science Expression” will be of some practical help in making the world a better place. About sums it up … elegantly. A very strong typhoon will attack northern Australia. Great amounts of water will fall. La Niña is still strong. Here you can observe on a regular basis. They call them cyclones down our way and yes its going to get soggy in the top end, but according to BoM La Nina is neutral. In the absence of La Nina the east coast is also wet, which is directly related to blocking highs. 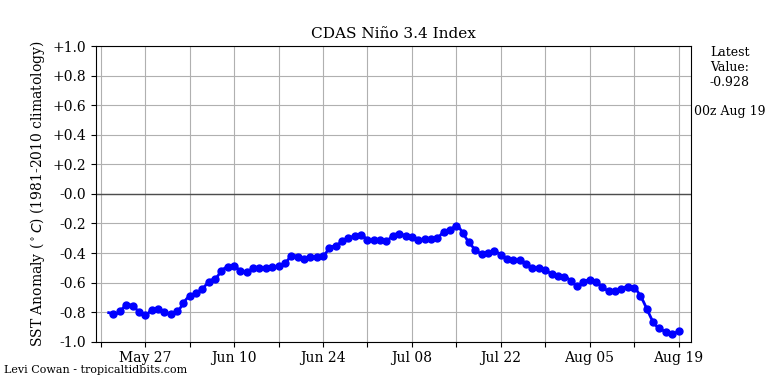 La Nina is now strengthening. SOI is the matter of the pressure difference between the two stations. Look at the ocean temperature in the Pacific. The drop in temperature in the region of 1.2 Nino means strengthening La Niña. Dunno, there’s still a LOT of warmer than normal water in the South Central Pacific … more characteristic of ending of El Nino … i.e. wavering nearer neutral. Yep, NOAA has it under discussion. This might be one of those classic cases where all the models fail. If we’re to get back to pre El Nino 18 year zombie-temp trend (lower and flat-ish) we’ll need a big global wet-spot to cool it down some more. A large increase in the magnetic activity of the Sun in 2015 (latitudinal circulation) made it possible to release energy accumulated in the oceans (El Niño). However, the atmosphere does not accumulate heat, as evidenced by the large amount of snow in the northern hemisphere. The low magnetic activity of the Sun to 2015 (meridional circulation) was delaying El Niño. The decline in solar magnetic activity (as it is now) will continue to disrupt the ENSO cycle. Meridional circulation disturbs the constant winds flowing along the equator. 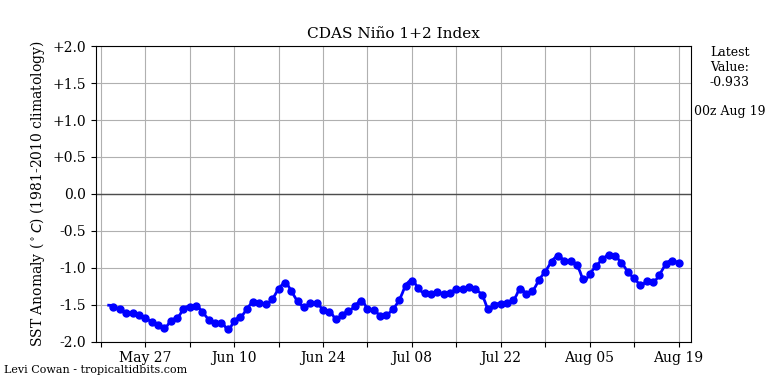 The Nino1,2 index shows that El Niño could have developed earlier. This index fluctuates the most. The association between solar activity and Asian monsoon (AM) remains unclear. Here we evaluate the possible connection between them based on a precisely-dated, high-resolution speleothem oxygen isotope record from Dongge Cave, southwest China during the past 4.2 thousand years (ka). Without being adjusted chronologically to the solar signal, our record shows a distinct peak-to-peak correlation with cosmogenic nuclide 14C, total solar irradiance (TSI), and sunspot number (SN) at multi-decadal to centennial timescales. Further cross-wavelet analyses between our calcite δ18O and atmospheric 14C show statistically strong coherence at three typical periodicities of ~80, 200 and 340 years, suggesting important roles of solar activities in modulating AM changes at those timescales. Our result has further indicated a better correlation between our calcite δ18O record and atmospheric 14C than between our record and TSI. This better correlation may imply that the Sun–monsoon connection is dominated most likely by cosmic rays and oceanic circulation (both associated to atmospheric 14C), instead of the direct solar heating (TSI). El gordo, the jet stream from the south will increase the amount of rain. Note that the cyclone in the north is visible in the tropopause. Thing is, if it starts to cool for real again, we’ll start to get 8 to 12 cyclones every year, and they won’t be those feeble sub-hurricane strength tropical storms, like ‘Marcus’, they will be the rippers we saw in 1960s and 1970s… or 1890s to 1920. The gen Y snowflakes at BOM and ABC have little idea that when it’s cooler, the cyclones become the real deal again, every time, and more of them. And that’s how those ‘public service’ time-wasters will learn that cooler conditions (contrast) is was generates devastating cyclones within the Australian region. It will be a bitter-sweet victory though, as persistent multi decadal cooling will be the vastly more tangible version of ‘climate change’, for everyone observing. Australians should by law be allowed one day every year (Jan 26th) to throw rotten fruit and dead flying foxes at all ABC presenters, senior staff, producers, executives, and especially that managing director tool. I want to see the Trots in the newsroom frog marched out the door. Your hypothesis, more serious cyclones under a cooler regime, has merit but requires evidence. Mortality numbers will not be admissible as proof of cyclonic strength. The cyclone in the Indian Ocean may turn south. Just imagine when the ABC’s top announcer “Max Hype” gets to this! So, BBQ thick steaks, lots of beer,..
…with the old stage lights on, lighting up the backyard. They used to have a Maxine Hype too, but she got hysterical and lost her seat … and strangely, no one even seemed to care! … devo! My guess is that the”Union of Concerned Scientists” are really concerned about their gravy train being derailed. Don’t forget that Anthony Watts’s dog is a member. The only qualification to become one is a valid credit card. Anthony Watts’s dog probably wasn’t allowed to vote on the statement because the ”Union of Concerned Scientists” probably consider him a Climate Skeptic (or worse). Two dogs and a cat went up to the bar for a drink. The bartender replied,’ You can’t drink in my bar because you are all underage’. This joke is only understood by musos. However Watt’s dog could be excluded because it is underage, with a false ID. When I think of so called secret science I think of magic, witchcraft, sorcery and the like. So yes indeed, scientists should stop effectively using magic, witchcraft, sorcery and the like and get back to real science. It would be a welcome move in a number of areas, not just in climate change. They can start by applying the scientific method as they did in the past. If they did it now the climate change models would be thrown into the rubbish bin immediately, and all talk of catastrophic global warming and destructively rising sea levels would be met with civil action if not imprisonment for causing unnecessary alarm and a public nuisance. Not a lot of people know this but the scientists are spot on with all their predictions and are using a magic crystal 8 ball given to them by the aliens that landed in New Mexico years ago . So now they’re caught between a rock and a hard place by Pruitt because they can’t reveal the existence of alien technology. What a breath of fresh air, finally some integrity being forced into the climate debate. I mean being forced, because integrity wasn’t going to find it’s way into the climate debate any other way. By skeptics who had not gone away. Wow. Smacks of the 17th Century reformation, no? It would be interesting to know what previous statements have been made by the EPA , but coupled with their then current knowledge. Pruitt will meet intense internal and external opposition. And it’s already started. And as usual, they speak who know the least about what the EPA has done, overdone and the damage they have ignored fixing so they could do the former things. I hope he’s up to it. We need a cleanout of the EPA, firing of numerous so called scientists who signed off on bad science for political reasons. Unfortunately firing a government service employee is about as easy as flying with a feather stuck in each ear. Very much to the point Roy. There are so many real world problems that could use some systematic analysis and resolution that it may not be necessary to fire people from the EPA, just redirect their energy. One major issue that seems to plague California and Australia is bushfires. Every year, here in Australia, we have serious bushfires adjacent to urban populations. In the most recent, a few days ago, seventy homes were destroyed by fire. With proper control measures most fires can be kept away from built up areas: perhaps all the surplus EPA staff could be put to work to articulate the solution. That work would be much more useful than the current tilting at windmills and climate craziness. I wouldn’t trust them even that far. Give each one a pair of scissors and get them to clear the undergrowth back hundred metres or more from any fence (under a whip-yielding overseer) and they might achieve something useful. Now that’s really on target, down to earth thinking. On a more serious note, this could be good news. From “Latest News” in SMH (iPad ap version, today). I think Keelty is one of the good guys, and if the brief he’s been given is wide enough we could get a decent assessment. The way the article reads (keep in mind that this is the SMH writing) this tragedy may have been the fault of the rural fire service. Apparently they initially refused to call in the Main fire trucks and the union felt rejected. The photo in the article looks hilly and probably the only thing that could have prevented the tragedy was regular clearing of excess growth. One report said that the “main fire truck(s?) were designed for suburban work, not bush fires, but that is the big question for Keelty. My understanding is that the fire started in Tarraganda, up near Bega, and roughly NW of Tathra. I happened to have travelled from Sydney to Kiama by train on the Sunday, the day of the fire, and was aware from the time we came out of the tunnel at Redfern that there was a strong wind from that general direction. It remained noticeably strong and from that quarter all the way to Kiama, where there were local reports of a temp of 40 degrees. Believable, even if not official. My assumption is that the fire got into the rough country north of the Bega River, and ran before the wind to cross the river and run on into Tathra. 1, 8, 27, 64, 125,216, 343 … If intensity increases with load cubed, as I read somewhere.?? If the fuel load increases at the rate of a tonne per he tare per year, and the area hasn’t been hazard reduced for 7 years… Unstoppable. Even on the lower scale. A firestorm waiting to happen. That address is across the road from a parcel of bush about 120 metres deep, sloping down to the cliff, and 250 metres across. A big load waiting to run uphill. It is a beautiful forested land. My sister’s experience was so devastating that it made me and her community very fire aware. When I worked in the bush I was involved in mopping up after a fire in Hillston, although these were mainly grass fires. All the locals loaded up their trucks with a tank and fire pump and off we went. Very much the Rural fire service volunteers. The last fire I was involved with very peripherally was near a national park. We emptied our gutters and put sprinklers on the roof and ran them with blocked gutters. Helicopter water bombing was on and fire trucks abounded. No doubt all aspects of this case will be properly looked at. Two of the streets mentioned in the earlier news items were Wildlife Drive and Oceanview Terrace, a bit to the north and east from the pin, and near the Bowling Club which was considered unsafe for local evacuees at one stage. I’m sorry to hear that you’ve had more brushfires. They plague anything where the vegetation isn’t kept wet and growing year round. Southern California is always a bomb ready to go off when it’s hot and dry in the summer. But January was unexpected. On the other hand hand, the weather does as it pleases so maybe we’ve no right to act surprised. We used to have the sense to know we should clear firebreaks at intervals and they were effective generally. But with a strong wind driving the fire that went through so much of California in January maybe nothing would stop it. But I haven’t seen the usual firebreaks on the local hills for a long time now — environmentalism at its best I think. And now we have more rain, a much more severe storm, up to 10 inches in just hours predicted, coming at us while everything below the burned off hillsides is still vulnerable. We’ll be alright here but just 30 or 40 miles north along the coast they’re going have a lot of trouble and a wide area is under mandatory evacuation orders. This cycle of fire and flood has repeated itself throughout my life. I used to drive the Pacific Coast Highway through Malibu to get to work and one year, even without fire, I saw cars parked along the cliff side of the road become buried deeper and deeper in mud with each storm until several of them couldn’t be seen at all by the time the rain ended and the cleanup could start. When there was widespread fire we were largely lucky to not have such heavy rain the following winter. But this year is a double whammy. Fire, flood, earthquake, tornado, hurricane, rain and snow have never ceased to gnaw away at civilization. But at least Jerry Brown has been proven wrong with his foolish statement that drought was the new normal. I was right all along when I said to anyone who would listen, “The rain will come back.” And now I don’t know whether to rejoice or cringe. Maybe I should do both. Both the wind and the rain are destined to be blamed on climate change. The powers that run roughshod over us need a bogyman to point their fingers at. And the weather just laughs at them. Too bad they can’t hear the laughter mocking them. Hi Roy, weather _ we can work with that. We’ve had winds and a constant drizzle of rain here for the last day or so. Please read the Christopher Monckton article 03-19-18 @WUWT. That article truly shows that ‘academic meteorology’ is but arrogant incompetence bordering on if not including, clinical insanity! Why else would anyone claiming ‘science’ also claim that EMR power flux is a form of “heat energy” (an aggregation of power in mass over time); both latent and sensible heat. While 1,2 can be done with sufficient ‘learning’; 3 has never been observed nor measured by anyone, ever! I could go on ’till the cows come home; but CAGW believers are dining on beef brisket; rather than our red-beans and rice of those that can do rather than only teach (academia)! I love navigating through some websites – the Union of Concerned Scientists has a grand total of fifteen scientists and four engineers, one nuclear safety expert and the rest clean vehicle engineers – the scientists are mostly alarmists and there are some analysts and policy experts. I think that the readers of this page could very easily form a far more qualified and eminent union! That many experts are needed to move the Doomsday Clock … wrong, that’s another group of expert scientists. How dare you denigrate Kenjii Watts that way! Thank you Jo this article is good news for the entire world. This is a great initiative and one that should be applied universally. However, having worked in several fields of collaborative research, I know that there is another matter that needs to be addressed if this first step is going to work. One of the biggest barriers to ensuring that publicly-funded research has ‘impact’ and is adopted more broadly is the infuriating tendency of many public agencies to jealously guard their ‘IP’ – put simply, data from their own research. It can often be really hard to publish or even harder to commercialise research outputs when one or more of the collaborating partners refuses to licence its data or IP, on the basis that some bloodyminded public officer somewhere thinks they are a gatekeeper, and if ‘we’ paid for the thing, ‘you’ can’t have it. In some cases this is doubtless because to provide access to their research outputs would be to show how little they do with the funding, or how little value the taxpayer is getting from it. Other times it is just some perverse sense of ownership or empire building. Whatever the motives, governments need to force agencies of all kinds to collaborate more openly and stop treating every little piece of IP as though it has a potential commercial value in the millions or might give their counterparts in other agencies a ‘shortcut’ and help some other guy’s career. Get over yourselves. If the public paid for it, the public bloody well owns it. Unless you have a distinguished track record of successful and profitable commercialisation, stop locking every piece of IP away. THIS issue needs to be addressed if Pruitt’s initiative is going to work. Can you even describe what may be meant by ‘intellectual property” (IP)? Nothing ever discovered can be be some ‘property’ (ownership), Even the most ‘secret discovery’ of our side is always ‘giggle-arity among those of the enemy! You wan dat data back? Costas you three cases of Miller; for 4 cases we offer fine fifth of Stolly, we is dying out here without good US beer! Even communists believe in IP if they can get it. The first day of spring in New York. 2:05 pm, 32 degrees Fahrenheit, and SNOWING! 11.01 pm, still 32 degrees, still snowing and raining. It is still snowing in the northeast of the US. Scott Pruitt is expecting scientists to act scientifically..
Is there no end to the bastardry of the right. The jet stream will immobilize the cyclone in the north of Australia and cause long-lasting rainfall. Yet taxpayer funding persists for the voodoo sciences. There’s not a problem with their subject matter, it’s their methodology. Can you imagine the improvement if Educators, Psychologists and and Sociologists actually practiced science in exchange for the funding they get? So much for Trump’s claim he was going to do away with unnecessary red tape – here he is reeling out even more of it. This tobacco lobby document aimed at the EPA was laying out a strategy for implementing time-consuming procedural hurdles designed to delay and hamper the EPA’s work. Scott Pruitt appears to be recycling the exact same nonsense, this time on behalf of another lobby whose livelihood seems threatened by the EPA whose mission is to protect the nation, its citizens and their environment from externalised costs associated with various industries. Yes CT, the non-science and tactics of the AGW Industry is very similar to those presented by the tobacco industry. Refusal to present data, lies and baseless propaganda.. Very similar. Is that really the best you can do CT. You are a JOKE. !! I do understand why you think that climate scientists should hide their work..
What I have seen has been some of the sloppiest, most unscientific GARBAGE to ever get printed. But you have to give him some credit. He does show a lot of confidence for someone pushing an empty wheel barrow: no scientific mechanism linking CO2 with global temperature variations, and he does show up for work well presented in a suit. The funniest thing I’ve noticed over the last few weeks has been President Trumble telling labor and the greens that the CAGW _ CO2 thing isn’t real. True, it’s not real, but sure as shootin, the money being made from it by people he knows well, sure is real. I feel like I living in South America, very precarious, for everyone but the elites. It is not “red tape” to require that the basis of a rule be made public. To claim this is to show a complete disregard for the ordinary meaning of the term. Bringing in the tired old “same as tobacco industry” meme is just laziness. There is no valid comparison. There is no reason that Pruitt’s proposal should delay or hamper any EPA work except to the extent that it would make the EPA actually abide by its mission. The EPA calculation overlooks the very real phenomenon of thermalization. Trace ghg (all ghg except water vapor) have no significant effect on climate because absorbed energy is immediately thermalized. The EPA calculation of the GWP of a ghg also erroneously overlooks the fact that any added cooling from the increased temperature the ghg might have produced is also integrated over the “lifetime” of the gas in the atmosphere so the duration in the atmosphere ‘cancels out’. Therefore GWP, as calculated by the EPA, egregiously overestimates the influence on average global temperature of noncondensing greenhouse gases. The influence (forcing) of a ghg cannot be more than determined by its immediate concentration. The EPA assessment completely ignores the effect of water vapor which, by far, is the most important ghg and appears to be the only significant ghg.